An Untimely Frost is the first volume of a new series set in 1880's middle America. 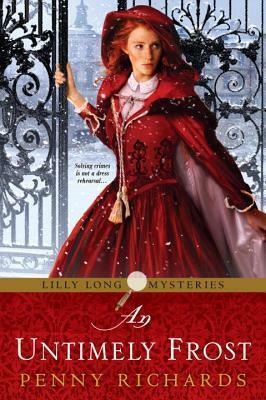 Lilly Long is a young woman, orphaned at an early age and taken in by a traveling theatrical troupe. Lilly has developed into an accomplished actress but made a bad choice in her scoundrel of a new husband. After he attacks her and absconds with her life savings, Lilly decides that she needs to make a change. She is intrigued by an advertisement by the prestigious Pinkerton Detective Agency. The Pinkertons are looking for a female agent. Allan Pinkerton has hired women before with great success and Lilly thinks her acting experience would be a plus.The two Pinkerton sons, William and Robert, are not so enthusiastic however. Her first interview is a flop but Lilly manages by using her skills to get herself hired anyway. Her first assignment is a missing persons case in the small town of Vandalia, IL. One of the town's preachers and his family disappeared twenty years earlier, leaving a large property derelict. Lilly's client has hired the Pinkertons to find the family in order to purchase the property, Heaven's Gate. People in Vandalia don't want to talk to Lilly and she senses a deeper mystery than a missing persons case. And who is the handsome boxer who seems to turn up wherever she goes? Lilly's first assignment leads her into dark secrets and danger, but she refuses to give up. Lilly Long is the very definition of "plucky" in her dogged pursuit of the truth. I am not as familiar with the constraints placed on women in 1880's America as I am with Britain's idea of propriety in the same period. It seemed to me that Lilly had a lot more freedom of movement and access that I would have expected. Perhaps the respect given to the Pinkerton badge accounts for her relative ease. She is a likable character who makes the sort of rookie mistakes that I would expect from a fledgling investigator; one who is more innocent than she appears. Penny Richards is obviously an author with a lot of experience in her craft, and one who has done her research. An Untimely Frost is a good read and I look forward to the next in the series. Thanks to Kensington Books and NetGalley for an advance digital copy in return for an honest review. Garden Shows Can be Cut-Throat.